I’d love to spend this entire post just trumpeting the features of this product…however Rob has already done that! So I shall direct you to his original posts if you’d like to learn more about the software itself. For this post, I’d like to focus on a specific (and kickass!) way I’ve learned to utilize the tool. Many BI consultants struggle to determine the best practice for capturing historical snapshots of reports and dashboards (there are many right answers). There’s plenty of software out there for it, or you can take the hard road and attempt to do it manually. By manual I mean renaming the file periodically and saving it somewhere else at whatever cadence you determine is best, not ideal in my book. Basically unless you’re lucky enough to have access to a something like SharePoint with near-limitless version history enabled (which is rare), keeping an audit trail is a pain in the booty. With that being said…I’m here today to show you a straight forward and simple solution to this…using Power Update as your own personal historian. 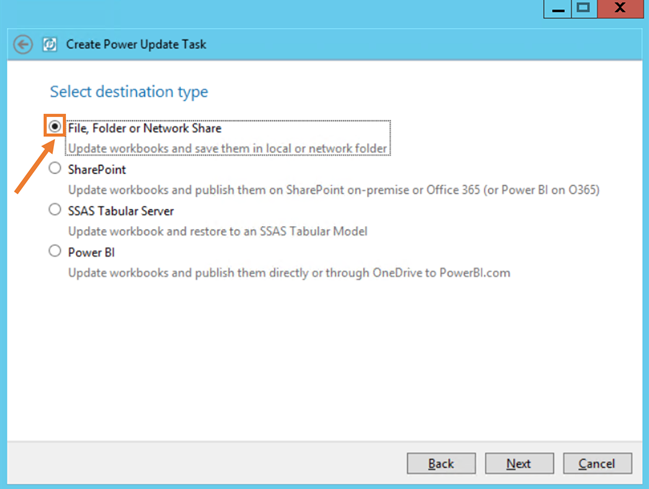 The entire premise of Power Update is to create tasks to perform various functions involving Excel or Power BI Desktop files. Now these tasks typically revolving around something involving a refresh (just call me Captain Obvious). However using a bit of ingenuity we can come up with some creative ways to utilize these tasks. There are TWO major customizations in the task settings that let us easily create snapshot tasks. First off there’s a option to disable workbook refresh. So essentially it’ll run whatever is specified in the tasks, but skips refreshing the file. Secondly, there’s an option when saving the file to append a timestamp to the file name. This allows us to create a uniquely named file every time this task ran. With these two examples in mind why don’t I hop us into a visual walkthrough and show you how to create this task. For this example I’ll go ahead and create a task to produce a Snapshot of an Excel file every Sunday at 12:00 AM, and save it to a designated Snapshots folder. To make it easier I’ll visually indicate any steps that always need to be set this way when creating a snapshot task. NEW FEATURE: Coming Soon To An Application Near You! So the software engineers over at PowerON JUST added a feature update to allow us to create a Snapshot task for Power BI Desktop files as well! This is very exciting news (for me) since I’m continuously leveraging more and more reporting needs in the PBI universe. It’s currently only available in the beta release, but will be available in the next major update. The process is nearly identical to creating the task in Excel save for a couple differences. The main requirement being that we will need to setup the task to Publish to OneDrive, which essentially saves it to a local folder for you. There you have it, simple right? Now this tool will grab your file and create a snapshot of it at whatever interval you set, it’s your very own personal Way Back Machine! Well this is just the tip of the Power Update iceberg folks, I’ll be posting more “cool” (Iceberg, get it…anyone?) ways to use Power Update as the year progresses. I wanted to keep today’s post sweet and simple (and hopefully useful! ), so until next time P3 Nation. Why have I delayed implementing Power Update? Great Post. One of the things that came out of the Microsoft announcement last week, was that Power BI Free are losing the ability to ‘Analyze in Excel’. 1. Build your Power Pivot Model in Excel. 2. 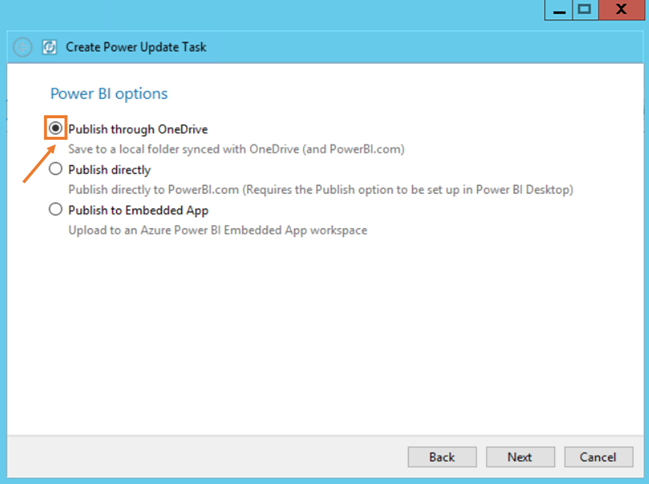 Let Power Update load it to OneDrive on a scheduled basis. (Also works with the Free Version). 3. Connect the OneDrive file to Power BI, and create Dashboards to your hearts content in the Power BI Service. 4. BONUS: When you want to Analyze in Excel, just open the file from OneDrive and multiple people can collaborate and author on the same file. Thanks, Reid! Very useful article, and I’m sure a lot more people are going to be looking into PowerUpdate. hello, can you explain why you set the checkbox ‘do not refresh workbook connections’ ? …Shouldn’t you refresh the data when taking a snapshot ? When taking the snapshot, you don’t have to load the data. All you are trying to do here is to get a snapshot of your workbook. You can always go back to any of these snapshots, and refresh it from your datasource, and now it will contain all your data. I have this turned off since I actually have a seperate task for refreshing the data itself every other hour. This tasks runs seperately once a day to just snapshot the file, doesn’t need the data refreshed when it does. Hope that clears up some things! I don’t have any experience with Power Update, but I’m doing a bit of research for a client. They asked me if Power Update was still relevant given everything Power BI Service can do, especially with the Premium option. Thanks very much for your thoughts.